Ease-of-use is just one of the reasons that Alphacam is the industry standard and system of choice for programming CNC routers. Tooling and machining techniques unique to this industry are accommodated by Alphacam’s dedicated Router modules. Horizontal aggregates for machining parts such as hinge reliefs and lock mortices, are easy to control using Alphacam. Standard fixtures can be created and saved within the system and inserted on to work planes when required, providing significant time savings. 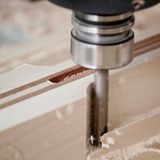 Head mounted rotary axis on CNC routers can be programmed at any workplane. Aggregates with a programmable rotary axis and manual tilt are fully supported, as well as routers with fully interpolating 5-axis heads. Safe rapid moves between planes are automatically controlled and verified using advanced solid simulation. Alphacam’s powerful post-processing ability means that the advanced functionality of all CNC controllers is utilised, including plane rotation. Artwork and text can be easily created and machined using Alphacam’s powerful 3D engraving. This command contours geometries with a form tool, and on meeting a sharp corner automatically retracts the tool to produce a sharp corner, often referred to as embossing. Multiple 3D rough and finish machining strategies of Solids, surfaces and even STL files are available within Alphacam. These strategies can be applied to any work plane, allowing for 3 plus 2 machining to be programmed on machines with 4 and 5-axis rotary heads. Alphacam’s 5-axis module is cable of 4 and 5-axis simultaneous machining of surfaces and 3D trim curves, often used for finishing chair backs. Maximising material utilisation is made easy using Alphacam’s automatic nesting functionality. Parts can be selected from the screen or a kit of parts, their orientation fixed (if grain direction needs to be maintained) or rotated to any angle. Nesting supports tool lead in/out, support tags for small parts and multiple depth parts where an onion skin is required. Using Alphacam’s Constraint Manager, geometry can be made parametric, rules such as tangency can be applied between individual elements, and variables such as distance set between them. By changing the variables, the geometry is automatically resized and resolved and because of the rules applied its integrity maintained. This makes creation and subsequent machining of families of parts very quick and easy. Using Alphacam’s Multi Drilling command toolpaths can be optimised for any drill unit. Holes are matched to the drill diameters and automatically machined; multiple drills are selected at the same time when a standard 32mm pitch is matched. Alphacam is a completely integrated CAD CAM software solution with advanced features. It is designed to offer your business enhanced productivity, exceptional reliability and additional flexibility. Alphacam’s ongoing program of development and enhancement ensures it not only keeps pace with the changing needs of users throughout the woodworking industry, but also delivers maximum return on your CAM investment. Alphacam also offers you the latest front end CAD part modelling facilities via our solid modeller. For cabinet door manufacturers the automated CDM module produces nested output and collates customer orders for high volume production. Alphacam Art 3D relief modelling and machining software for CNC routing and engraving projects such as carving decorative ornate panels and doors, swept flourishes, custom millwork, architectural mouldings, dimensional signage, bespoke company logos, jewellery pieces, custom gifts and awards. Plus many more applications. Alphacam Art’s 3D component construction tools make it easy to work with existing 3D models and to design your own 3D shapes. 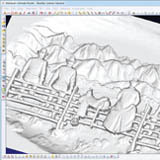 Alphacam Art, is based on the world class VCarve Pro design engine and uses the same logical and easy-to-use interface. With Alphacam Art, users can quickly and easily convert 2D sketches, photographs, drawings and graphic designs into unique high quality 3D carvings and designs. Alphacam Essential The ideal entry level product for basic 2D CNC work. 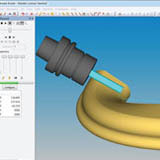 This module offers the fundamental tools required for CAD CAM production, including nesting of parts from the screen, and 3D Engraving. Alphacam Standard The perfect product for shops and subcontractors. 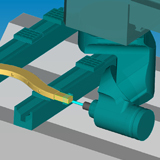 This module offers all the functionality of the Essential package with additional support for nesting of parts from a nest list, horizontal machining, reusable machining data (Machining Styles), and much more. Alphacam Advanced Targeted at the manufacturer who works with complex, free-form patterns and tools. In addition to the functionality of the lower level modules, this module offers complex 3D machining strategies, solid model importing and feature extraction, constrained parametric part creation and much more. This module also incorporates Microsoft’s Visual Basic for Applications and is suited for those that can utilize Alphacam’s add-on or custom built applications and automation tools. Alphacam Ultimate Adds support for full 4/5-Axis simultaneous machining for highspecification joinery and furniture manufacturers. Our most technically advanced edition for live 4 and 5 axis machining. For 3 axis machining with parametrics and full automation utilities. For 3 axis machining without parametric drawing capabilities. Basic 3 axis machining at an affordable price. For operators and shop supervisors to open and examine Alphacam files.